The long and weary January expedition to International CES is now upon the consumer electronics industry. 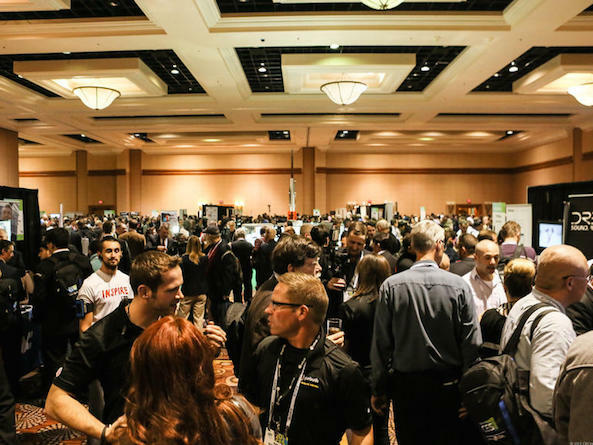 Each year, the entire industry descends upon Las Vegas, NV with more than 150,000 attendees. 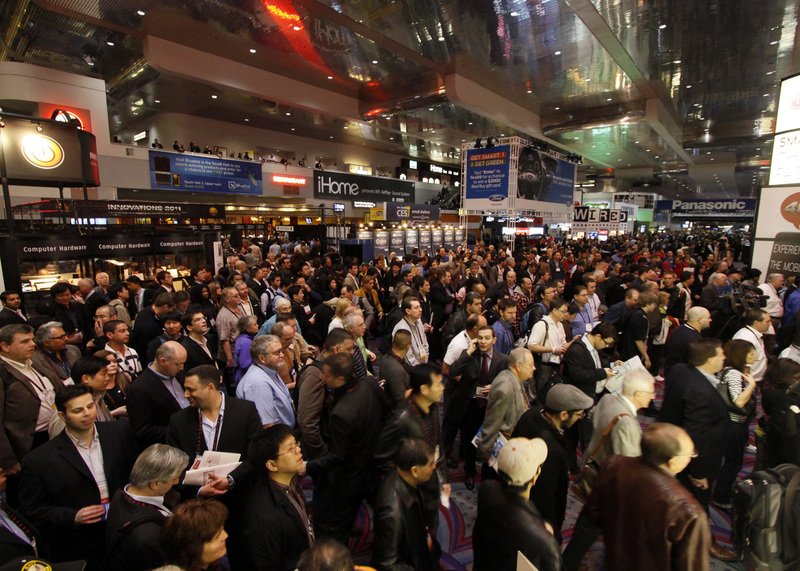 Noted as one of the largest trade shows in the world, CES is quite a spectacle. Everything from app powered toothbrush games to global players like Sony, Samsung, and LG will be in attendance. Each year, we head out to the event in hopes of learning about new iOS devices and accessories. Through a week’s worth of events, press conferences, and booth meetings, the upcoming landscape for Apple-related tech is revealed. From Sunday, January 4 through Friday, January 9, I will be trekking across Vegas’ strip in search of the newest items, which will hopefully include Apple Watch accessories. 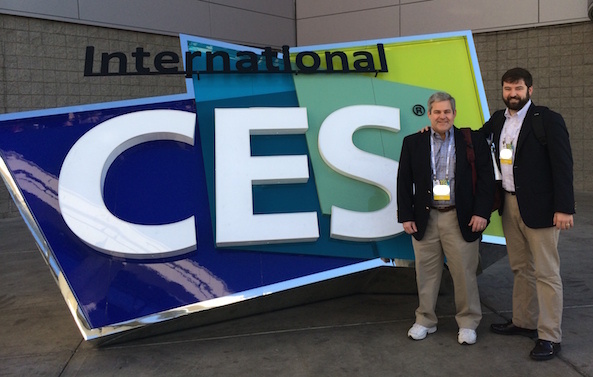 CES 2015 marks my third consecutive trip and having two previous shows under my belt, the planning strategy this year continues to evolve with my experience. Three trips hardly make one an expert, but no longer an amateur, my novice skills are at work in preparation for one of the most exciting weeks of the consumer electronic year. I will be flying out on Saturday, January 3, getting settled in, then surviving the next seven days. Pictured above, last year dear ol’ dad came along for the ride. As he is also an electronic industry affiliate, I was able to convince him to make the trek with me. We had a blast as a father-son duo, soaking in all of the excitement, even test driving a BMW i3. Unfortunately, this year, I won’t have the pleasure of his company, but the show must go on. 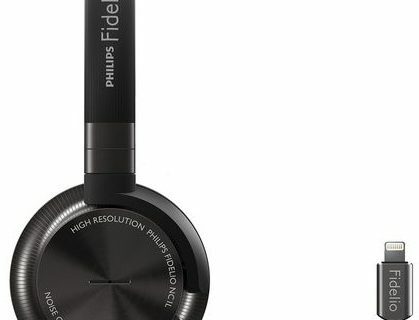 The week of CES is a long extravaganza of releases and new devices. Although Apple notoriously never makes a public appearance at the show, thousands of companies develop iOS-related gadgets each year. Personally, my goal for CES 2015 is to find Apple Watch accessories. Several charger concepts are already floating around the internet, but I would like to see what pops up at CES. Additionally, HomeKit items should be in high demand because Apple released the API mid-2014. Sunday and Monday are both considered Press Days. The whole thing kicks off with a state of the industry address, which will discuss in broad terms where consumer electronics are today and what to expect to see over the week. Top trends are a highlight and the details about new key areas or advancements in specific locations will be addressed. In the evening, CES Unveiled kicks off with sneak peaks at new products, sure to make a splash on the actual show floor. Unveiled is the press’ first look at the new hot items and a chance to mingle without the murmur of the larger event later in the week. Throughout Monday, several companies will host their official 2015 launch press releases. You may remember last year, Samsung’s press release was complicated by Michael Bay’s on-stage melt down and I had the (dis)pleasure of watching him unravel live. Another session I am excited to attend is “iDevices Connected,” a conversation about iDevices’ upcoming home automation with HomeKit for iOS devices. 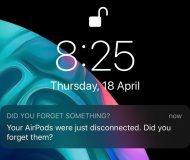 According to iDevices, Apple approached them in 2014 about the HomeKit API and the company will be releasing one of the world’s first HomeKit enabled products at this event. My favorite activity during the day is attending the ShowStoppers “Launch” event, where up to ten startups give timed pitches to venture capitalists. Think of it as a real world Shark Tank. One of them will be funded, but only after being pummeled with questions. 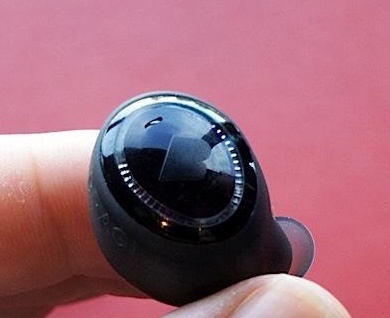 Monday evening, I am heading to an event specifically highlighting advancements in Bluetooth technology. With so many iOS accessories relying on this medium, it will be important to hear the latest news. Finally, the night will speed up with PepCom’s “Digital Experience!” hosted at The Mirage. This gathering puts press members face to face with a long list of companies, while throwing a magnificent spread of food and beverages. Digital Experience! is one of the best places to make new contacts. The official show floor opens at 10:00AM PST on Tuesday. This time is a mad house in the Las Vegas Convention Center (LVCC). The facility, which takes up about two full city blocks, is crammed with attendees waiting to rush the floor, hoping to be the first to see a new tech gadget. There are four main halls in LVCC and all of them have lines outside. Think of Black Friday at Best Buy, but every gadget crazed person in the entire world flew to Vegas and is anxiously waiting at the lobby door. The LVCC, however, is not the only location where items are being shown. 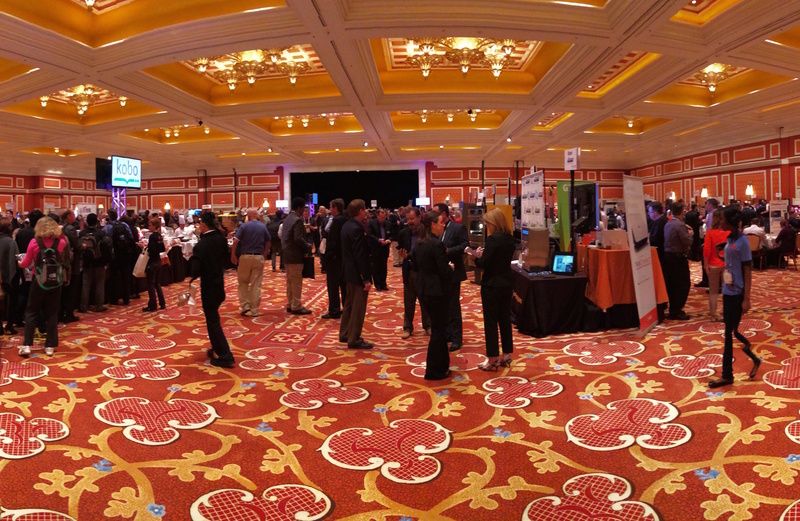 CES’ show floor extends to the Westgate, Renaissance, Wynn and Encore, The Venetian and Palazzo, and Aria. During the week, mini-conferences and press conferences continue to happen concurrently with the main show. Previously and again this year, I will be sticking to the main floor and passing on any exterior events during the show floor times. For a full list of scheduled events, check the CES website. During the open floor hours, I will be meeting with companies to discuss upcoming product reviews and giveaways for iDB. In previous years, I scheduled most of my time for specific meetings. However, this year I limited my scheduled meetings to the following companies: Incipio; Bluelounge; Belkin/Linksys; Outdoor Tech; Phiaton; and Swann. Additional arrangements were made to have a dedicated conversation at Scosche, Kanex, Just Mobile, ProClip USA, Otterbox/Lifeproof, Griffin. Otherwise, I will be perusing through the iOS-related booths looking for great upcoming gadgets. Gems from last year included iOS-related first-looks at full-sized iOS controllers, Native Union’s newly popular line of wooden cases, Lifeproof’s frontless waterproof case, and multi-device syncing Bluetooth keyboards. Tuesday night, I head to ShowStoppers @ CES. This event, like Digital Experience!, is a closed show floor only open to press. A myriad of companies will be in attendance at a smaller more intimate gathering. It is much less crowded than the show floor and even less crowded than Digital Experience!, making relationship building a higher priority. Last year, CES was all about wearables and there was strong messaging around that expectation, even prior to the event. This year, there is no singular clear item jumping out of the communications for CES 2015. However, there seems to be a lot of rumbling around drone technology. Not necessarily globalized commercial drone tech, like Amazon’s insistence that packages will eventually be delivered via drones, but consumer grade drones. From nano drones to larger more robust options, drones may very well be a big topic of conversation. Either way, the reason for iDB to attend is iOS-related accessories and apps. Be sure, I will be hunting down new things for us to review and potentially giveaway on the site! If you are hoping to see a first hand account of the show floor and press events during the week, make sure to follow me Follow @Jim_Gresham and I will tweet pictures and videos to keep everyone updated. Follow my progress from inside the Unveiled event Sunday night for sneak peaks, the giant Samsung presser on Monday, private parties at night, and the show floor crowds. Also, make sure to keep a close watch on the homepage starting Sunday. The other editors will always have a post public before I can actually write up an article. With limited time and a tiny internet connection, publishing posts is a difficult task. Twitter will be the best way to see the action from a press perspective!